Parents are the most important source of love, well-being, trust and encouragement for their children. They play a leading role in guiding and supporting their daughters and sons until they can lead independent lives and, in many cases, this support continues well into adulthood. When parents live in vulnerable circumstances or experience extreme hardship, they may not be able to care for and protect their children. Sometimes families break down, and as a result, children may need to be taken into alternative care. With the right support and encouragement parents can build on their strengths, skills and knowledge to improve their family’s situation and create a stable and caring family environment for their children. 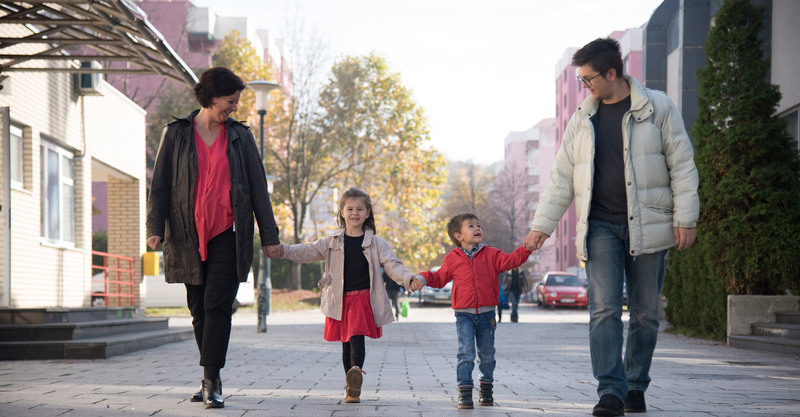 Investing in parents can be an effective tool to prevent families from falling apart. We invest in families in countries all around the world. We work with parents or other family members who have taken on the role of a child's primary caregiver so they can become self-reliant. Self-reliance means that parents are able to adequately care for and protect their children, from early childhood until independent adulthood. Some of the committed and courageous parents we are supporting in different countries around the world are sharing their stories. Learn more about how family strengthening support has made a real difference in the lives of families. Dayana had her son when she was only 14 years old. Being a teenage mother was not easy for her, and the relationship with Joel, her son’s father, also became strained. Without the help of her own mother, she would not have been able to continue her education. Today, Dayana is a professional cosmetologist. She has even stepped up to take on a leading role in her community as president of the community centre where she lives. To help her reach her goals and give the best possible home to her son, Dayana and her boyfriend Joel enrolled in the SOS family strengthening programme in Arequipa, Peru. Because her mother helped her with her son, Dayana was able to continue studying. “She helped me during the day and at night I took care of my child,” she says. But the situation put her under a lot of pressure. Dayana had to get up at three in the morning to be able to prepare for the day and be in school on time. She started to attend workshops and activities for families in situations of crises provided by SOS Children’s Villages, and eventually Joel also joined the activities. An SOS family strengthening co-worker supported them throughout the process. Both Dayana and Joel realised how important their own development was for their son. Joel says that the support he has received has helped him become a better father for his child. “Before, my attitude was different, I was impulsive, selfish, immature. Little by little, I felt his affection. Now he loves me, he doesn’t let me go,” he says. On the outskirts of Lusaka, Zambia’s capital, there is a residential area known as Chaisa. Chaisa is a low-income neighbourhood characterised by tiny, closely-built concrete houses. Tucked in one corner of the local shopping centre is a small shop called S&J new fashions. 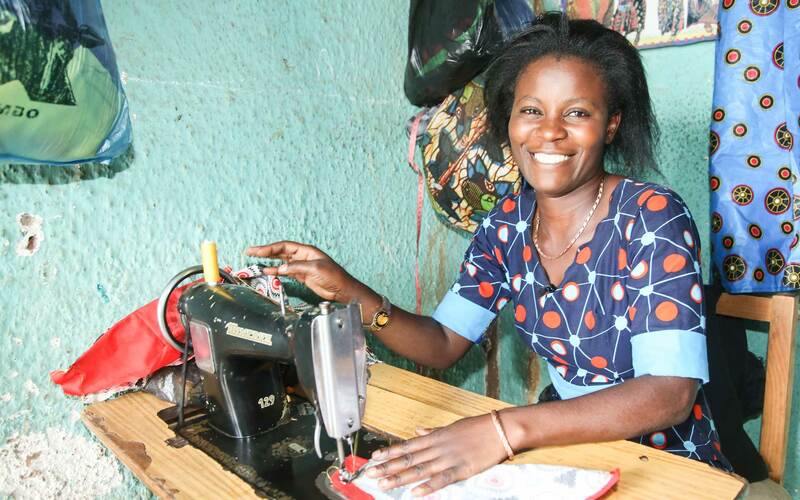 Sherapy Phiri, 32, works here every day, tailoring and designing clothes for men and women. Without education, the mother of two girls struggled to make ends meet. Gaining vocational skills through SOS Children’s Villages Zambia has allowed her to earn an income, which she hopes will give her daughters a better future than her own. "I did not complete primary school, because my parents could not afford to pay my fees beyond grade seven," Shirapy recalls. "Shortly after dropping out of school, I got married. Life was tough for us without a stable income. I worked in a salon braiding hair, but my real interest was in sewing. I looked forward to the day that I would learn to sew and open my own place, but that dream was fading." Sherapy applied for a tailoring course at the SOS vocational training centre in Lusaka and things began to change. "I would like my children to get a good education and have more opportunities than me," she says. "One of my daughters says she wants to be a teacher, and the other one wants to become a doctor. I want to help them achieve their dreams." Anne, her husband Oleg and her 12-year-old son Vladimir* left the conflict-stricken area of Luhansk, Ukraine, in 2014. Although they left the unrest far behind, they did not find the peaceful life they had hoped for. The relocation put a lot of strain on the family, as it did on thousands of others who fled the conflict in eastern Ukraine. Unemployment, limited household resources and the lack of a community network in their new place affected both the parents and the son emotionally. Through individualised support for all family members, they started to recover. The young mother knew they desperately needed help, but in a city where they had no friends or relatives she did not know where to turn. Then, she got another work offer in Kiev and the family moved again. Vladimir did not want another change and reluctantly went along. 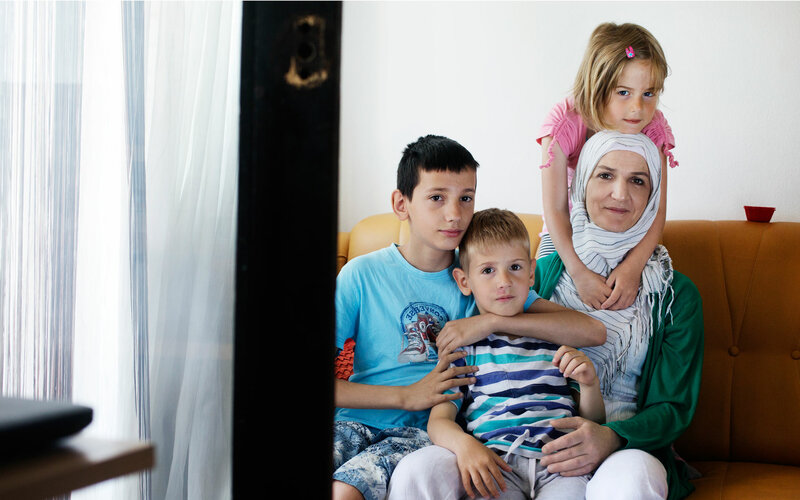 In Kiev, the family found out about SOS family strengthening support. Both Anna and Vladimir immediately had psychological counselling. In addition, the family received necessary in-kind help such as food, hygiene items, clothes and school stationary. Vladimir enrolled to the programme's computer class where he became one of the most regular attendees. For computer class, Vladimir would often consult his father, an IT engineer. His knowledge and skills made the boy stand out among his peers. He started to help the little children in the class. Vladimir's self-confidence was back and with it came success. He made an effort to fit in at school, and he became one of the best students. Seeing the positive changes in his wife and son, Oleg joined the programme's classes and groups as well. The young father began attending the financial literacy course, while the entire family began attending family art therapy sessions where they were encouraged to think of a way of spending quality time together. Anna and Oleg single out their son's adaptation and acceptance of their new life as their biggest gain from the family's inclusion in the programme of SOS Children's Villages. Vladimir still longs for his home city, but is making plans for continuing his education in Kiev. Edilia and her family live in Santa Cruz del Quiché, an area in Guatemala where over 80% of the population is indigenous. People from indigenous descent experience many disadvantages in Guatemala, which makes children and families particularly vulnerable to challenges such as malnutrition, poverty, poor education and inequality. In such a context, women and children are often particularly likely to face exclusion and a lack of opportunities. Edilia has seen the difference the support from SOS family strengthening has made for her family. To give something back to her community, she has started to help other women to learn how to read and write. Slowly, tides began to turn. The family enrolled in SOS family strengthening activities, and has been able to improve its living situation. The food supplies provided once a month have alleviated the pressure on the family’s limited income, and Edilia and her husband have been able to make some investments to improve the living conditions for themselves and their children. Eventually, they were able to build a modest house, where the four of them are living with Edilia’s brother. Edilia wants her little daughter to have better opportunities than she did. She believes that educating women is an important tool to break harmful patterns such as domestic violence and discrimination. She knows what it is like when you do not have access to the same rights as men. Being able to read and write can be an important protection for women to avoid that others take advantage of them, says Edilia. That’s why she has helped other women in the community to acquire these skills. SOS Children's Villages supports families in Guatemala through activities that help curb malnutrition in the communities as well as through family development workshops, early childhood development activities, access to literacy classes and educational activities to empower community leaders and foster communities’ organisational skills. In the sprawling township of Philippi in Cape Town, South Africa, each day is a struggle for the very basic of needs. Nearly one million families live here in small iron sheet shacks. In this impoverished community, HIV and AIDS prevalence is high, and young people are suffering alcoholism, unemployment, violence and drug abuse. Dropping out of school prematurely is a way of life. Making a living in this township is not easy. People in Philippi typically do manual work, some run small businesses selling alcohol or vegetables, sewing, or washing cars. Most hardly make enough for their families to survive on. In this area, SOS Children’s Villages South Africa works to strengthen families such as Nyalela’s, a grandmother who has assumed the role of the primary caregiver for three grandchildren. The aim is to improve the living standards of poor families through basic needs support and ensure that children have access to essential services like education, food and health. At 64, Nyalela is raising three grandchildren aged between eight and 21. She had eight children herself, but six have since died. Her daughter died in 2011 from meningitis, leaving the three boys in her care. Nyalela was already struggling to make ends meet with her monthly pension of R1,600 (€107). Having three additional mouths to feed overstretched the little resources she had, putting a strain on their food security and undermining the chances of meeting the nutritional needs of the children. Although it is possible to access social grants from the national government in South Africa for child support, foster care, disability or pension, these amounts are very small and hardly cover the bare essentials. “We survived on my pension and child-support grants, but the money was not enough,” says Nyalela. To make life easier, Nyalela joined the family strengthening programme in 2012. Since then, SOS co-workers such as Nosiphewo Gobo-Mpehle, an SOS community child and youth care worker, have supported her as the head of her household and caregiver of the children. With the burden of caring for her grandchildren now shared, Nyalela was able to join a local women’s society where she saves R500 (€33) of her pension. Last year, she bought bricks to extend her house from one to two bedrooms, and bought the children a bunk bed. The boys now have their own room. Nyalela is saving to buy them linen. “The SOS team has become part of my family. I am not alone as before,” says Nyalela. “If it was not for support, my family would have been badly affected. Sometimes children run away from home when their needs are not met. They live under a bridge somewhere fending for themselves, with no schooling and no hope for the future,” she says. Nyalela loves her grandchildren, but the continuous responsibility that comes with child care overwhelms her. She has arthritis and says washing the children’s clothes hurts the muscles in her aging hands. She wishes for a washing machine. But even with her health problems, Nyalela does the best she can. Join us in building and supporting families so children can grow up in a loving home.